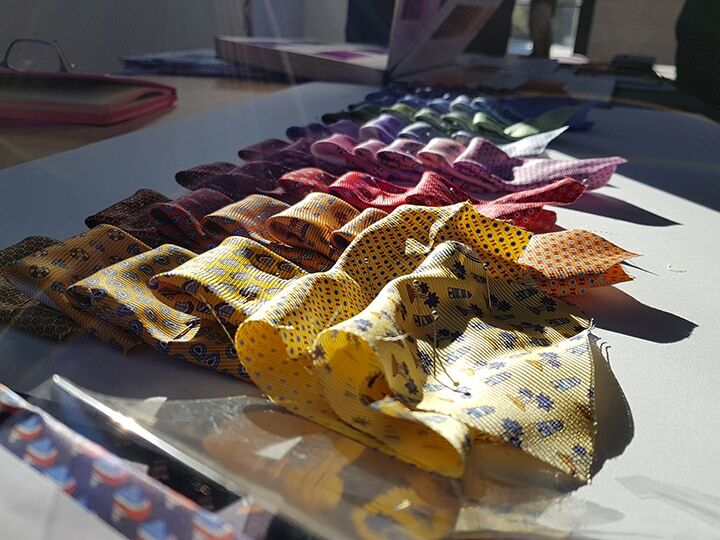 Italian textile manufacturing’s center of excellence opens its doors onSaturday 23 and Sunday 24 March,on the occasion of the FAI Spring Days, to reveal the secrets behind the making the men’s accessory par excellence: the tie. “Le stanzedeicreativi” is the title of an exhibition designed exclusively for the FAIDays by Casa Zegna, where visitors will be able to follow the work of the Group’s designers, phase by phase. On Sunday there will be four “tables”dedicated the tie creation process: inspiration, pattern design and color development process, screen print and paper test, color sampling on fabric swatches and the finished product. The artists who imagine, design and create Zegna ties will give a public demonstration of their work. The Group’stie production goes back to the Seventies and the setting up of Orsini di Cameri, whose history is documented in the Archives, which also provide the images and documents on display in the permanent exhibition entitled “Ermenegildo Zegna. Cent’anni di Eccellenza. DallaFabbrica del TessutoallaFabbricadello Stile” (Ermenegildo Zegna. A Hundred Years of Excellence. From Textile Factory to Style Factory).The Archives also preserve notebooks that Ermenegildo Zegna wrote in on his first trip to New York in 1938 – a hugely inspiring adventure not only for him but also for the artists who designed the tiesin the Capsule Collection – along with a mass of other documents and material of enormous value for the history of Made in Italy. On the FAI Spring Days it will be possible to visit the heart of the company, the Zegna Wool Mill, open to the publicon an exceptional basis for guided tours (Saturday and Sundayat 10.30, 11.30, 14.00, 15.00 – booking obligatory). Key attractions include the reopeningof the very first Zegna store(1939) in the Centro Zegna inTriverofollowing the restoration of its original furniture and the introduction of a new retail experience with a made-to-measure service. There’s something for small kids too:on Sunday, from 10.30 onwards, there will be Montessori-inspired workshops on the colors and stories of springtime. Kids will be able to usefabrics,recycled materials and wooden pegsto create characters to hang on the “stories line”. Another possibility: visitors will be able to walk around the contemporary art of the “ALL’APERTO” project (without guides) and enjoy site-specific works by artists of international renown. With the advent of spring, Daniel Buren’s “Colored Flags” will be flapping again, from the roof of the Wool Mill to the Conca deiRododendri. All the tours and workshops are free of charge. Booking is obligatory only in the case of visits to the Zegna Wool Mill. Donations to FAI, FondoAmbienteItaliano will be most welcome. Zegna Wool Mill tours: Saturday 23 and Sunday 24 March, at 10.30, 11.30, 14.00 and 15.00. Booking obligatory.